While at the Port Townsend Ukulele Festival last weekend, I took a wonderful class by Danielle Ate The Sandwich on tips for recording for YouTube. All of her advice was good and straight-forward and just what I needed. The process I’d developed for recording myself was certainly quite an affair and at sometimes a slog that would leave me exhausted and frustrated at the end. Seeing how easy it was to make decent video with even just a phone inspired me to find an open spot on the Fort Worden campus and make a video. It’s the first piece I ever learned, over a decade ago. I’m pretty pleased with the result, and I look forward to making some more impromptu videos. For those who’ve asked for it, here’s the tab: September in the Rain (Ukulele Tab). It’s not my arrangement – it’s based on the intro to the full song that I played in a group a long time ago that I reconstructed from memory. A little over a year ago I outlined an index card based system for organizing my ukulele practice sessions. I designed it to help me retain old material while always learning more, to keep my practices structured but still interesting. I used it to create and execute regular practice sessions for several months with great success. In fact I even had the great opportunity to share my system at the first Port Townsend Ukulele Festival during Cathy Fink‘s session on practice tips. Now, the system wasn’t without its flaws – the biggest complaint was its complexity. While I still believe in the system’s core goals, I’ll admit that the particular implementation I came up with isn’t for everyone. With that in mind, and in light of this year’s ukulele festival, I thought I’d take another whack at the problem, and distill last year’s system into something a little more user-friendly. My goal has never been to become a professional musician. I just want to be able to make some nice music for my family and friends without any notes, aids, and with a little more than a basic up-down-up-down C, F, G7. Track all of the new material I want to learn. Track my progress with the material I’ve already started learning. Make it easy to create fun practice plans that balance learning new material with retaining old material. Something to practice written on the face. How many times you’ve practiced it tallied on the back. The more cards the longer the practice session. Try to have a mix of cards, ie. some with no tallies, some with a few tallies, and some with lots of tallies. After you’ve practiced each card, add a new tally to the back and return it to the stack. The new system starts, like the previous one, with a stack of index cards. This is your Practice Stack. Size, color, lines or plain, it’s up to you. Just get a good sized stack. Now, each card in your Practice Stack is going to represent some particular thing you want to practice. It can be a technique, an exercise, or even a whole song. So on one side of the card, write or print exactly what you want to practice and for how long. If it’s a technique or exercise, give it at least five solid minutes. For a song, at least long enough to get through the whole thing two or three times. You can be as vague or specific as you want, whatever works for you. For example, let’s say you want to practice picking your C Major Scale. You can write a simple “C Major Scale / 5 min” or a more elaborate “Finger-pick first-position C Major Scale with a metronome for five minutes”. Personally I prefer being a little vague, one because it’s easier to write, but also so I have room to experiment while still using the same card. In the beginning, I might practice that C Major scale as slowly and accurately as possible, staring at the fretboard the whole time, but after a lot of practice I might decide to use a metronome to rock out that scale with my eyes closed. Being vague on the card lets me use one instead of two. Now to start out your Practice Stack, I recommend creating at least a good thirty index cards. Remember, this is your list, so pick things that you want to practice. Your stack won’t be the same as anyone else’s, and that’s okay! Are you in a uke group? Are there songs the group always plays? Add the songs! Are there members who do techniques you’d like to be able to do? Add the techniques! Do you have any uke books? Add the book’s exercises! 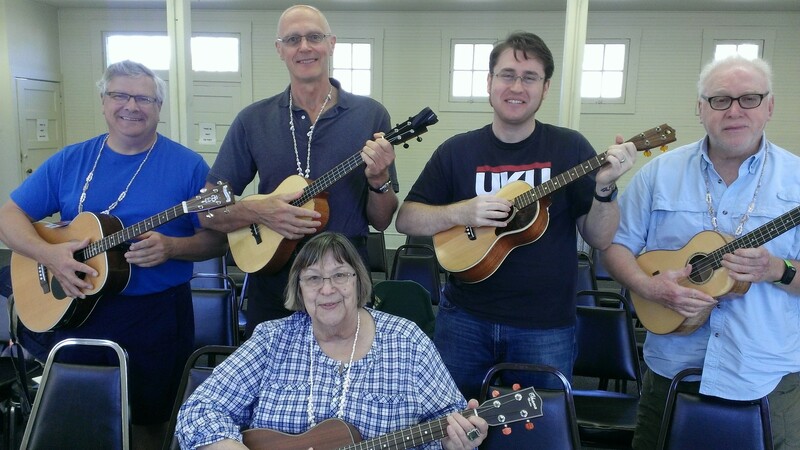 Attend ukulele workshops? Add the teacher’s exercises! The only recommendation I have is to keep a mix of songs and techniques. It’s tempting to list out just the song’s you’d like to learn, but you’ll get much better if you throw in some technique practice. Where the front of the card keeps track of what you want to practice, the back keeps track of how many times you’ve actually practiced it. Every time you practice what’s on the front, you’re going to add a tally to the back. How you tally is up to you – you can use pen marks, stickers, colored squares, whatever works for you. The goal is here is to give you both a physical representation of how much practice you’ve put in and also an easy and quantitative way to compare cards with one another. You’ll use this information to help you decide what to practice. The number of cards you draw will dictate how long you practice. By placing them face down and choosing randomly, you’ll make sure that no practice is the same. By watching the tallies on the back, you can make sure you can get that balance of new and old material. Now, what will happen is, over time you’ll build up this nice set of index cards with all of the things you’ve learned, and you’ll be able to quickly see the things you’ve focused on and the things you haven’t. It’s quite the feeling to have a physical artifact in your hand of all of the effort you’ve put into playing the ukulele. That’s it! I hope this helps folks out there, especially those that were intimidated by all of the charts in the first iteration of this system. Does this work for you? Have improvements or other ideas? Let me know in the comments!